The coolest nature crafts for kids, that cost next to nothing or are completely free kids crafts. Take a quick look over these toddler crafts below and find one to get you started. When your child gets involved with any toddler craft activities they should be supervised at all times. In many craft activities for kids there are many small parts. If your toddler is left unsupervised they may put these in thier mouths. Which could lead to swallowing and possibly choking. So better to be safe and only organize these nature crafts for kids when you can watch over them. This is a very popular toddler activity. they just love glueing and sticking stuff and creating works of art. So let them loose to create their own nature collage. Obviously you will need to go on a nature walk to collect things to use in the collage. Such as leaves of different kinds and sizes. Flowers and bird feathers. Almost anything small and light can be used so get collecting and have some fun. Then go home and get started with these ideas below. 1. I would use a stiff piece of cardboard as your base (I cut out one side of a breakfast cereal packet). 2. You could also cut out pictures from old magazines and comics that fit the theme. 3. Then give them some stick glue and get them to stick the pictures and their nature walk collection bits on to the cardboard base. 4. Tell your little one to stick lots of pictures so you can't see the base. Don't interfere too much let them be creative as it is the doing that is important. It will be beautiful no matter what when they have done. Print off this bugs sheet and see how many insects your little one can recognize. They may not know them all to start with but believe me it won't take them long. Click on the image here to download your insect sheet. One of the most popular toddler activities is coloring pages of any kind. So I have put a few insect coloring pages below for you to print off for your toddler to color in. Just a few more coloring pages by popular demand. So print off your free butterfly coloring pages below. This is a little fun nature crafts for kids project. 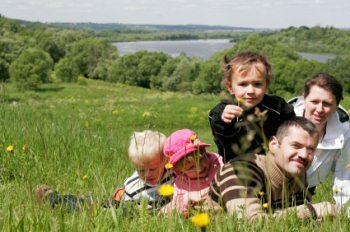 On your nature walk get your toddler to look out for rocks, stones, pebbles. They need to be fairly small and smooth. See if you can find any interesting shape ones. Then get them home and give then a good wash to clean them up. You can get your toddler to do this outside with a bowl of soapy water. Then leave to dry before painting. The best paints for this easy kids craft project are acrylic paints that you probably have already. Also an assortment of different size paint brushes will come in handy. You need to set everything up ready for your little one to get started. So put some old newspaper down on the table first. Then have a couple of the best rocks to hand and the paints and brushes well within reach. "why not do some yellow spots on that rock"
"why not paint some blue stripes on that rock"
Don't get too involved and definately don't end up painting the rocks yourself. These nature crafts for kids projects don't need much help from mom or dad. So just print off and have the coloring crayons ready and leave your toddler to it. What nature craft activities do you love doing with your little one ? So why not pick up some great new ideas here and share your nature craft ideas here. I know other parents will thank you for it. Tell us what you and your little one like about this nature craft activity the most. 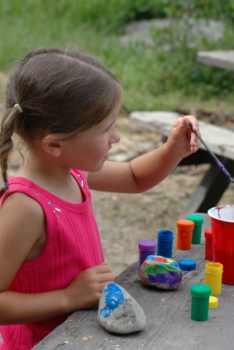 (example title) Nature craft for kids using pebbles ! Your story will appear on a Web page exactly the way you enter it here. You can wrap a word in square brackets to make it appear bold. For example [my nature craft idea] would show as my nature craft idea on the Web page containing your story.